Tillit S. Teddlie [1885-1987] was born, raised, lived, worked, died and was buried within the borders of the great state of Texas. He spent his life in service to his God as a minister in the Churches of Christ, and also as one of our best-loved hymn writers. On any given Sunday one can rest assured that somewhere, among some group of devoted disciples, a Tillit S. Teddlie hymn is being sung. A few of his better known works are: Heaven Holds All To Me --- Worthy Art Thou --- When We Meet In Sweet Communion --- What Will Your Answer Be? Teddlie's songs had a definite toe-tapping, soul-stirring quality to them, which may well be why a good many of them were published by the renowned Stamps-Baxter Music Company and brought to life in countless performances by their powerful quartet. One of my personal favorite hymns from the pen of this fellow minister of the gospel of God's matchless grace in Christ Jesus has long been Singing Redemption's Song, to which he wrote both the words and music in 1923. "Over and Over the melodies ring, Wonderful theme, glorious theme! Heaven resounds with the tribute they bring, Singing redemption's song! Sing the sweet story -- redemption's sweet song; Over and over the chorus prolong; Shout the glad message and join with the throng; Ever we'll sing praise to the King, Singing redemption's song." One thing you can most certainly count on the redeemed of all ages doing when they have experienced a great deliverance at the hands of their God is: they will sing and shout praises unto the Lord. They will celebrate. They will rejoice. It has happened throughout biblical history here on earth, and it will happen again as we come before the throne of the Father on that great resurrection day. We, the redeemed of all ages, will sing redemption's sweet song. The people of Israel had been delivered. For hundreds of years they had languished under the cruel oppression of their Egyptian taskmasters. The Lord God heard their cry for help, and He raised up a deliverer in the form of Moses. The sea divided before them, and they walked through on dry ground, as they journeyed away from Egypt. The sea closed up again upon the army of Pharaoh as they pursued the people of Israel. Then in a moment of spiritual clarity (one which, sadly, would all too quickly fade) they perceived with awe the power of God displayed in their deliverance, and they sang a song to the Lord, which is recorded for us in Exodus 15:1-18. This song of redemption was accompanied by dancing and the sound of instruments. "And Miriam the prophetess, Aaron's sister, took the timbrel in her hand, and all the women went out after her with timbrels and with dancing. And Miriam said, 'Sing to the Lord, for He has triumphed gloriously'" [vs. 20-21]. There was great rejoicing and celebration that day as they sang, played and danced before the Lord. "Oh give thanks to the Lord, for He is good; for His lovingkindness is everlasting. Let the redeemed of the Lord say so, whom He has redeemed from the hand of the adversary" [Psalm 107:1-2]. Yes, they were redeemed ... and they were saying so. When all of God's singers get home. Having overcome sin, "Hallelujah, Amen"
David prays, "Stretch forth Thy hand from on high; rescue me and deliver me out of great waters" [Psalm 144:7]. In response for this great redemption, David says, "I will sing a new song to Thee, O God; upon a harp of ten strings I will sing praises to Thee" [vs. 9]. David, although clearly speaking of a more immediate personal deliverance, nevertheless, by inspiration, portrayed that great celebratory throng before the throne as they sang of their deliverance, "holding harps of God" [Rev. 15:2]. As John saw the throne room of heaven, he beheld the twenty-four elders (which most scholars believe represent the 12 tribes and the 12 apostles, which in turn represent the redeemed of both covenants), and "they each one had a harp" [Rev. 5:8]. Time and again in this vision of the redeemed before God's throne, we behold these victorious saints in possession of "harps of God" as they worship their King. Strangely, this revelatory fact has greatly troubled, and, yes, even angered, some men and women who are numbered among the ultra-conservative, highly legalistic and patternistic factions and sects of Christendom. In their view, any use of a musical instrument that is in any way even remotely associated with the singing of praises unto God is an abomination. Thus, they become highly agitated when these passages in Revelation are mentioned. If they could rip them from the pages of Revelation they would gladly do so ... however, they are even more fearful of the inspired words that say, "If anyone takes away from the words of the book of this prophecy, God shall take away his part from the tree of life and from the holy city" [Rev. 22:19]. So, they are stuck with heavenly harps of God, although they avoid these passages like the plague! It is certainly no secret to anyone that there are some within Christendom who firmly believe the use of musical instruments in the corporate worship of the church today is sinful in the sight of God. Indeed, some of these will even go so far as to declare that such instrumental accompaniment to singing will send those involved straight to hell. I have nothing but the utmost respect and love for those who have chosen to offer up praise to their Father a cappella. Unaccompanied vocal praise by an assembly of saints can be some of the most moving and melodious sounds ever heard this side of heaven. It is the preferred methodology of my own faith-heritage, and I am very comfortable with it. But, brethren, it is time for some personal honesty here -- the doctrine that accompanied singing of praises to God will keep one from entering heaven is not Bible-based. In fact, such a view is not even hinted at in Scripture. There is not one single sentence anywhere in the Bible that even hints that God regards accompanied singing as "sinful." Not one verse!! This doctrine is based entirely upon no greater foundation than human assumptions drawn from what is perceived to be biblical silence. And yet, the Bible is far from silent. In both OT and NT documents we clearly find God's approval of such accompanied singing of praises. Not only was it commanded by the Lord in times past, but it is anticipated in the courts of heaven! The redeemed of all time are seen before the throne, singing the song of Moses and the Lamb, "holding harps of God." And yet, there are those who will insist to the end of their days that God will send one to hell for employing on earth what He will give them to use in heaven!! I suppose we may need to amend the Lord's prayer to exclude the part that says: "Thy will be done on earth as it is in heaven!" Please, please, don't misunderstand my point here. Some will immediately declare, "Al Maxey is trying to bring instrumental music into those congregations that have chosen not to use it." That is NOT what I am suggesting. Not even close. I fully respect those who have chosen to embrace an a cappella worship style. That is the style employed where I currently serve, and I have absolutely no desire at all to change that practice. None whatsoever. Nor do I have any desire to condemn those brethren to hell who have honestly chosen to embrace a worship style different than my own. Nor do I have any desire to try and force them into conformity with my preference. I do not believe those on either side of this issue have the right or authority to seek to enforce their conviction upon the other. The reality is -- and this is my point -- God Himself, in this present Christian dispensation, has chosen to speak neither for nor against the use of instrumental accompaniment to our singing, therefore neither should we. God never called it a SIN ... neither should we. It is time for differing brethren to get out of the judging and condemning business and start learning to love and accept one another, even when, and especially when, they differ. You don't have to be my twin to be my brother, you just have to have the same Father. Some among us need to learn this Truth, and then start living it. Genuine unity is beyond reach until we do! Although the Lord God has not commanded the use of instrumental accompaniment to our worshipful singing here on earth during this present dispensation -- and, thus, neither should we -- there is nevertheless clear evidence of His approval of such instrumental accompaniment. Indeed, there is no hint whatsoever of divine disapproval of such anywhere in Scripture. For those who think there is, I hereby issue a public challenge to provide me with that passage. I will print it in bold type in the next issue of my Reflections along with my full apology! I have issued this challenge before over the years, by the way, and have yet to be provided with that passage. The fact that it is not forthcoming speaks volumes --- no such passage exists. This doctrine of disapproval is of human origin, not divine. Thus, I do not feel compelled to preach it and teach it. Instead, I will proclaim what is declared in Scripture ... and that is divine approval. Not command, for that too is absent from the NT writings, but rather an attitude of our Father that's never changed. He showed approval in the past and He shows approval as we stand before Him in heaven, and He is the same yesterday, today and forever [Heb. 1:12; 13:8]. He has, during the present dispensation, neither specifically proscribed nor prescribed. Nor has He declared a change in His perception of the matter between the past and the future. Thus, I think we can reasonably and safely conclude, in the absence of even a shred of evidence to the contrary, that He does not disapprove of those who choose to employ on earth what they will enjoy in heaven. NOR does He disapprove of those who choose not to. Perhaps this is a good time to revisit the principles of Romans 14, which certainly apply in this current matter. We've all read this passage many times. We're familiar with it, even though we far too frequently fail to apply its teaching. Perhaps you may find the following excerpts from the paraphrase known as The Message rather stimulating and thought-provoking. I believe it captures the essence of Paul's admonition beautifully. "Welcome with open arms fellow believers who don't see things the way you do. And don't jump all over them every time they do or say something you don't agree with -- even when it seems that they are strong on opinions but weak in the faith department. Remember, they have their own history to deal with. Treat them gently. For instance, a person who has been around for a while might well be convinced that he can eat anything that is on the table, while another, with a different background, might assume all Christians should be vegetarians and eat accordingly. But since both are guests at Christ's table, wouldn't it be terribly rude if they fell to criticizing what the other ate or didn't eat? God, after all, invited them both to the table. Do you have any business crossing people off the guest list or interfering with God's welcome? If there are corrections to be made or manners to be learned, God can handle that without your help. Or, say, one person thinks that some days should be set aside as holy and another thinks that each day is pretty much like any other. There are good reasons either way. So, each person is free to follow the convictions of his conscience. What's important in all this is that if you keep a holy day, keep it for God's sake; if you eat meat, eat it to the glory of God and thank God for prime rib; if you're a vegetarian, eat vegetables to the glory of God and thank God for broccoli. None of us are permitted to insist on our own way in these matters" [vs. 1-6]. "Cultivate your own relationship with God, but don't impose it on others" [vs. 22]. Yes, we need to be far more accepting of one another in those areas where God has chosen neither to command for or against. In those areas, we ourselves must not issue commands either for or against. Instead, we must allow our brethren the same freedom in Christ to follow their convictions that we insist upon exercising ourselves. Is it not rather presumptuous, to say the very least, for me to characterize something as SIN that even God Himself has not?! At just what point did God abdicate the throne and place Al Maxey upon it?! In view of the fact that He hasn't, I had better be very careful of what I seek to bind upon others as His will. If the LAW I seek to bind is based upon no greater authority than my own assumptions drawn from what He never said, then I fear I will one day have a lot of explaining to do!! God has never once, not anywhere in the Bible, said singing with instrumental accompaniment is a sin. He has never even hinted at disapproval of such. Not one single time ... NEVER! Therefore, for me to do so would be abominable arrogance! I can only proclaim what God DID say in Scripture, and in the book of Revelation, which was penned by John by inspiration of the Holy Spirit, we are shown the redeemed of all time standing before God lifting up their voices in praise "holding harps of God." That is in the Bible, whether some like it or not. Thus, it behooves us to examine why it is there. "And I saw, as it were, a sea of glass mixed with fire, and those who had come off victorious from the beast and from his image and from the number of his name, standing on the sea of glass, holding harps of God. And they sang the song of Moses the bond-servant of God and the song of the Lamb" [Rev. 15:2-3]. Although there is some diversity of opinion as to exactly what this instrument may have looked like, few would differ with the analysis that it was "a stringed musical instrument primarily used in worship" [Eerdmans Dictionary of the Bible, p. 553]. Josephus described it as "an instrument of ten strings" [Antiquities of the Jews, book 7, chapter 12, section 3]. The harp was "an instrument of joy and celebration ... and it accompanied songs of praise and thanksgiving" [International Standard Bible Encyclopedia, vol. 3, p. 441]. "Sing for joy in the Lord, O you righteous ones; praise is becoming to the upright. Give thanks to the Lord with the lyre; sing praises to Him with a harp of ten strings. Sing to Him a new song; play skillfully with a shout of joy" [Psalm 33:1-3]. This will all be brought to perfect fruition as those who are the redeemed of all time assemble before the throne with the "harps of God" in their hands and with the "new song" on their lips! As the early church spoke "to one another in psalms and hymns and spiritual songs" [Eph. 5:19; Col. 3:16], could this have been one of the psalms that poured forth from their hearts and from their mouths as they continually encouraged one another regarding this heavenly expectation? And would it have crossed any of their minds for even an instant that they were "speaking heresy" because they dared to make mention of those horrid harps?! Not likely! After all, John, via his inspired revelation, informed the saints of the earth that something wonderful awaited them in heaven: songs of praise with harps of God. These were "harps used in the praise of God; belonging to or given by God" [Arndt & Gingrich, A Greek-English Lexicon of the NT and Other Early Christian Literature, p. 432]. If God has such awaiting us in heaven, then just exactly what is it that leads some to believe He regards as abhorrent the use of such on earth?! There is no basis for such in Scripture, and there is certainly no basis for such in logic. Such rigid prohibition is nothing other than human preference based on human assumption elevated (wrongfully) to the status of eternal decree and universal law. There is only one logical conclusion that can be reached when reading John's revelation -- "In heaven the song of redemption is accompanied with strains of sweet instrumental music" [Dr. Albert Barnes, Barnes Notes on the Bible, e-Sword]. The longing within the breasts of God's people will at last be realized. 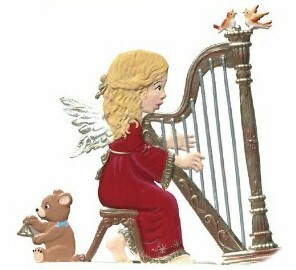 "I will sing to You with a harp, Holy One of Israel. My lips will shout for joy when I sing praise to You, because You have redeemed me" [Psalm 71:22-23]. As Tillit S. Teddlie so perceptively wrote: "Sing the sweet story -- redemption's sweet song; Over and over the chorus prolong; Shout the glad message and join with the throng; Ever we'll sing praise to the King, Singing redemption's song." When all of God's singers get home they will be singing redemption's sweet song, and as they do so they will be "holding harps of God." As the apostle John witnessed the vision of the redeemed gathered on Mt. Zion (as seen in Rev. 14:1f), "suddenly in this dazzling scene the sound of harps and singing is heard" [The Expositor's Bible Commentary, vol. 12, p. 546]. "And they sang a new song before the throne" [Rev. 14:3]. This is the song of Moses and the Lamb; redemption's sweet song, which pours forth from grateful hearts as "harpists played on their harps" [Rev. 14:2]. What a joyful scene!! "Under the Jewish worship, as far back as David's time, the harp was used to aid in sacred song. In a higher realm, where the joy is complete, the harp will never be hung on the willows, and it will never be out of tune" [The Pulpit Commentary, vol. 22, Revelation, p. 384]. These harps of old, so common to the people of God down through the centuries in their heartfelt worship of Him, "will now be used for the 'new song' of praise to the Lamb" in the heavenly realm [The Expositor's Bible Commentary, vol. 12, p. 469]. Those who continue to believe that any such use of instrumental accompaniment to singing of praises unto God is a soul-damning sin, whether here or in heaven, will counter by saying that the "harps of God" mentioned in Revelation are not real. "These harps are not literal, they are figurative. They are symbols, nothing more." They may very well be right. Revelation, after all, is filled with a great deal of symbolism. Are the gates really pearls? Is the street really gold? We don't know. They could be. But, then again, these may just be symbols that depict some truth our Lord seeks to convey. I think most would agree that a harp, when used figuratively, conveys the concept of joyous praise, typically of a musical nature. Homer Hailey, a dear brother in Christ, wrote in his commentary on Revelation, "Whatever these harps were, they were provided by God and were suitable for heavenly praise" [p. 180]. The great theologian John Wesley concurs, saying these harps are "given by Him, and thus appropriate to His praise" [Explanatory Notes, e-Sword]. Even if we admit that they are symbolic only, and that there will be no actual musical instruments in heaven, we are still faced with the fact that our Lord chose to use a harp as the symbol to express the concept of worshipful praise unto the Father, and that He chose the vision of saints singing and playing to convey the reality of joyous celebration of the redeemed in heaven, and that He presented this teaching by inspiration to the church on earth. Does such a biblical reality lend itself to a theology of approval or disapproval with regard to instrumental accompaniment of songs of praise? Given God's employment of such a symbol in the Scriptures, what might this reveal to us about how He perceives the practice? And if indeed God does disapprove of their use by His people during this dispensation, then why did He provide such a positive view of such use in the New Covenant writings? Seems strange that He would portray approvingly that which, if employed, would ban us from His presence! Just something to think about. Brother Al, I read and save every one of your Reflections that you send via email. You do excellent work!! Also, would you please send me all four volumes of your Reflections CDs ... the check is enclosed. Thanks! Man! !, Brother Al, I am so glad God has blessed you with the ability to be a good teacher, and also with the desire to earnestly dig a little deeper every day into Truth. I honestly believe that God, through you, Brother Al, has allowed me to consider things I would never have even thought of. Through you He has brought me to a better understanding of what Scripture teaches. I will send you a love gift to help cover your Internet expenses, for without the Internet how would I ever have come into touch with your Reflections!! Thank you! Brother Al, I just returned from a trip to Tanzania, which is on the east coast of Africa. While there, I discovered that the native preacher at the Church of Christ in Moshi continues to study your writings and is growing in the Lord. He is also using your materials in a number of small group studies that are taking place in the area. Thanks. God is great! Brother Al, I'm still thinking about your Reflections article titled Abba! Father! [Issue #291]. This is truly a beautiful thought. Yet, the apostle Paul often refers to himself as being a slave as well as a son, not seeming to see the vast gulf between those two concepts. How is it one can be free, and yet also a slave? Is not the statement which you quoted from the Expositor's Bible Commentary -- "This cry of 'Abba, Father' serves to emphasize the vast gulf between slavery and family relationship" [vol. 10, p. 92] -- a contradiction?! After sending the above response to this brother, I received the following reply: "Good Morning Al, Thanks for taking time out of your busy schedule to write. We are in agreement. I guess I was taking issue with you on this because in my perception I felt your article was promoting an either/or view -- i.e., either we are children or we are slaves. But, I agree with you; like a diamond, we are in a multi-faceted relationship with Him that has many a paradox. May the joy of the Lord be your strength this day. By the way, with the weather like it is in Toronto this week, global warming sounds like a good thing at the moment!!" Bro. Al, I always read with interest your writings regarding the Holy Spirit. In a response to a reader's comment in your latest issue of Reflections you referred to the Spirit as "the slighted member of the Godhead." This raises a question with me. Our congregation sings the song "Glorify Thy Name," in which there are three refrains: first to the Father, then to Jesus, then to the Spirit. As a result of my personal study, I do not see in the Scriptures where the Spirit is praised or glorified as are the Father and Son. So to be consistent with what I see in Scripture regarding praise and glorification, and to whom it is due, I don't sing the third stanza. This is not to say I disbelieve the Holy Spirit is part of the triune Godhead, but simply that the Scriptures do not mention any praise and glorification being directed toward Him. I certainly don't mean to slight a member of the Godhead, but rather see myself honoring the Spirit's revelation by praising and glorifying the Father and Son only. Do you have any thoughts or comments on this? -- aside from the typical: "In matters of opinion ... liberty!" Bro. Al, Your article regarding brother John Modgling [Issue #182] was so sad, and yet very intriguing. Please subscribe me to your weekly Reflections so that I may stay informed about issues that face the TRUE church of our Lord, and thus be able to "state the Truth in love." Thank you! Dear Sir, I am with a Foursquare Church here, and for close to ten years now my wife and I have been conducting Bible studies in our home on Monday nights. I use e-Sword as a study guide in assembling my Bible studies, and have personally distributed over 200 copies of the e-Sword program to others, along with most of the available plug-ins, so that they don't have to do the tedious job of downloading them with slow Internet connections. Right now the subject of our Bible study is the Minor Prophets, and I have found your web site to be very valuable and informative on this topic. Now, to my request -- I would like to have your permission to incorporate your in-depth studies on The Minor Prophets into the Topic Notes for the copies of e-Sword that I give away. It would be a great help to others who use e-Sword as a study resource. Thank you!